Well today JB and I spent outside doing yard work. He cut the grass, whipper snipped and I decided to go down to the veggie garden and tackle some weeds. Well since the ban on RoundUp we have really been at a loss as to how to conquer the task of getting rid of the weeds we get every year. You kill them, you pull them you strangle them you do everything but every year they come. Well, today I went down and started just going around the beets and the beans and potatoes and before I know it, I am on my hands and knees with my little garden trowel and I am raking the dirt and the weeds are really easy when the earth is damp to pick through the dirt one weed at a time. Well I thought it was going well. Stopped quite a bit to stretch and give my shoulders a break. Anyways JB finally gets those other jobs done and comes with the hoe and helps me and I just pick through the dirt now to accomplish my task. It was a huge job but you know after you get a chance to look at your garden and see things like your first tomatoes coming it makes it all worth while. This little tomato is called a Yellow Pear. Mum gave me some plants a few weeks ago she picked up at a Church sale and this is one of the exotic, well exotic to us, tomatoes we will be harvesting this year. There was an even smaller one on the top of the plant. So Mum if you are wondering how these are coming along, here it is. 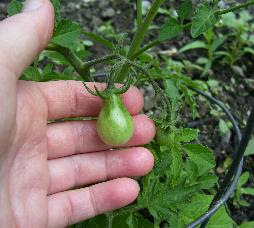 I noticed on the Mennonite cherry tomatoes they are producing already as well. All this work makes it all worth while and of course rain the the good Lord provides us with. Tomorrow more rain to come so our work is done and tomorrow we can just relax and maybe even get out on the Harley if we get out early enough.